Polish rabbi of the eighteenth century; born at Samoscz, government of Lublin; died at Salonica in 1778. He was successively rabbi of Chelm, Samoscz (a district rabbinate), and Lemberg. To the last place Solomon was called in 1771, to succeed the deceased Ḥayyim ha-Kohen Rapoport. In 1777 Solomon left Lemberg with the intention of going to the Holy Land. After visiting his family in Samoscz, he began his journey toward Palestine. Passing through Lemberg, he gave his approbation there, on Sept. 16, 1778, to Elijah of Belgorai's "Har ha-Karmel." Then he continued to Salonica, intending to superintend the issue of the second edition of his "Merkebet ha-Mishneh"; but he died shortly after his arrival there. Besides being an authority in rabbinics, on which subject he published several works, he was distinguished as a grammarian and mathematician. In 1776 Solomon wrote a defense of Joseph Te'omim, who had been criticized by many rabbis in connection with the issue of a divorce. Solomon gave his approbation for the publication of many current works, especially during the period of his incumbency at Lemberg. 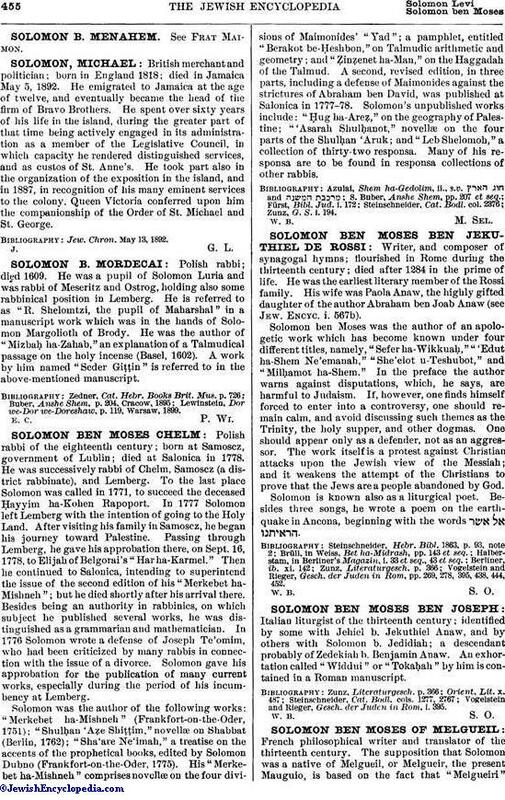 Solomon was the author of the following works: "Merkebet ha-Mishneh" (Frankfort-on-the-Oder, 1751); "Shulḥan 'Aẓe Shiṭṭim," novellæ on Shabbat (Berlin, 1762); "Sha'are Ne'imah," a treatise on the accents of the prophetical books, edited by Solomon Dubno (Frankfort-on-the-Oder, 1775). His "Merkebet ha-Mishneh" comprises novellæ on the four divisions of Maimonides' "Yad"; a pamphlet, entitled "Berakot be-Ḥeshbon," on Talmudic arithmetic and geometry; and "Ẓinẓenet ha-Man," on the Haggadah of the Talmud. A second, revised edition, in three parts, including a defense of Maimonides against the strictures of Abraham ben David, was published at Salonica in 1777-78. Solomon's unpublished works include: "Ḥug ha-Areẓ," on the geography of Palestine; "'Asarah Shulḥanot," novellæ on the four parts of the Shulḥan 'Aruk; and "Leb Shelomoh," a collection of thirty-two responsa. Many of his responsa are to be found in responsa collections of other rabbis. Zunz, G. S. i. 194.